I am sometimes asked by clients and other coaches to compare Integral Coaching, the methodology that I use, to other coaching methodologies. So I created this diagram as one way to illustrate the distinction between approaches. Integral Coaching is an approach to coaching that works with the whole person - body, mind, soul, and spirit - across self, culture, and nature. 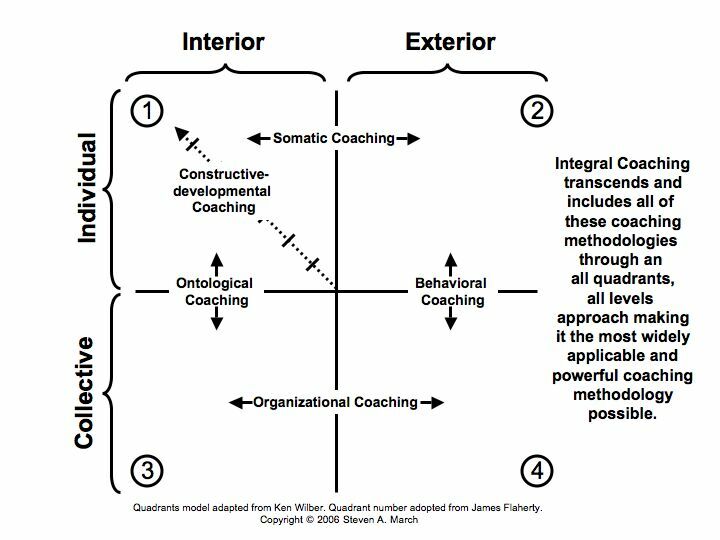 The diagram maps several coaching methodologies - behavioral coaching, somatic coaching, constructive-developmental coaching, ontological coaching, and organizational coaching - onto Ken Wilber's integral model to show the quadrants that they recognize and favor in their approach. The basic observation about non-integral approaches is that their quadrant favoritism limits their effectiveness because any change in practices in a quadrant will be undermined by established but unchanged resonant practices in the other quadrants. A classic example of the limits of quadrant-exclusive (non-integral) approaches are New Year's resolutions. When we make a resolution (an individual interior approach) it is usually undermined by our habits which are embodied (individual exterior quadrant) and reinforced by our network of friends (collective interior quadrant) and our physical spaces (collective exterior quadrant). In order to change our behavior, we have to change resonant practices in all four quadrants simultaneously by adding new body practices, changing our network of friends and how we interact with them, and changing our physical space. to make, complete, and integrate into our lives. Integral Coaching is the methodology created by James Flaherty and taught through and ICF-accredited coach training program at New Ventures West. In the interest of full disclosure, I must also say that I am on the faculty of this school. Steve, I find this diagram very useful in picturing how several prominent coaching approaches lay out on a map. In the spirit of usability, one thing that would help make it clearer is to draw arrows from the words "Behavioral Coaching" to show that it deals with both quadrants (rather than just occupying a line between them). Ditto for the other two-quadrant approaches. Great idea. I've updated the diagram. What do you mean by ontological coaching? If you are distinguishing the tradition that comes from Hermenet/Logonet/BDA type of coaching rooted in phenomenology, philosophy of language, and biology of cognition, I think you are misplancing it in the diagram. Another relevant issue here is that different practitioners in a particular tradition, have different styles and ways to cope with the dimensions you draw . But maybe I'm totally wrong, and talking about the wrong thing. Cool diagram! now everybody has a map to become more integral or sensitive to what may be missing. Yes, the idea is to use the map as a provocation to a more integral embrace methodologically. The map forms the background of a "critical theory" of sorts. Any approach that leave out or ignores quadrants is open to certain large categories of breakdown. So using the map, we point that out, and inquire into how an approach could be augmented, developed, or evolved to embrace all quadrants. I put ontological coaching in the two interior quadrants because, as I see it, this methodology is founded on phenomenology and hermeneutics which disclose interiors. I think modern day practitioners of ontological coaching have, out of necessity, started to include somatic and organizational coaching which are founded on empiricism, functionalism, and systems theory which disclose exteriors. I'm curious, how would you map ontological coaching as you know it? Maybe I need to update the diagram. I am going to updated my diagram. Nice one man.